Earlier today, April 4, the United States Mint started selling rolls and bags of America the Beautiful Quarters commemorating Cumberland Gap National Historical Park in Kentucky. This coin features the second of five different quarter designs for 2016 and it’s the 32nd issued since the series debuted in 2010. 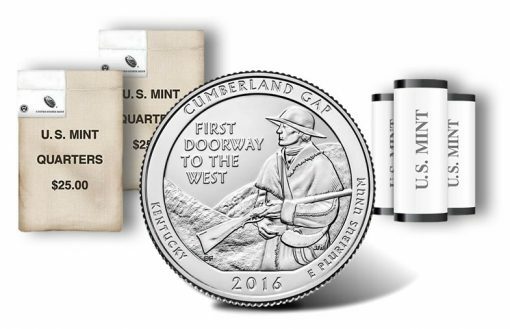 The U.S. Mint is now selling rolls and bags of 2016 Cumberland Gap quarters. The coin depicts a reverse design emblematic of the national site located at the border between Kentucky, Tennessee and Virginia. Cumberland Gap quarters are also entering circulation but don’t be surprised if you don’t see any for a long time. Banks around the country cannot order quarters by design or from a specific minting facility, so there’s no telling how long it’ll take for new ones to show up in change. There is a premium, but ordering quarters from the U.S. Mint is the easiest and quickest way to get them in large quantities and from all the facilities that make them. Public launch ceremonies are another option to get new coins quickly. One week from today, on April 11, the U.S. Mint and National Park Service will officially introduce the quarter. Free and open to the public, the event is at the Cumberland Gap National Historical Park Visitor Center beginning at 11:00 a.m. Eastern Time. While there, attendees can swap cash for rolls of the new coins. 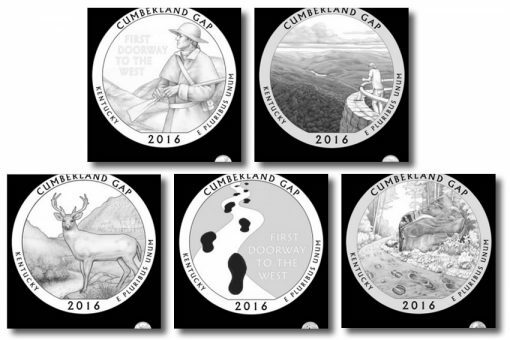 Five Cumberland Gap quarter candidate designs went under review before a final one was selected. All of them depicted scenes emblematic of the park’s narrow pass. Many pioneers used the pass on their journey into the western frontiers of Kentucky and Tennessee. Created by Barbara Fox and sculpted by Joseph Menna, the winning reverse or tails side design shows a frontiersman gazing across the mountains to the West. Inscriptions around the scene include CUMBERLAND GAP, KENTUCKY, 2016 and E PLURIBUS UNUM. 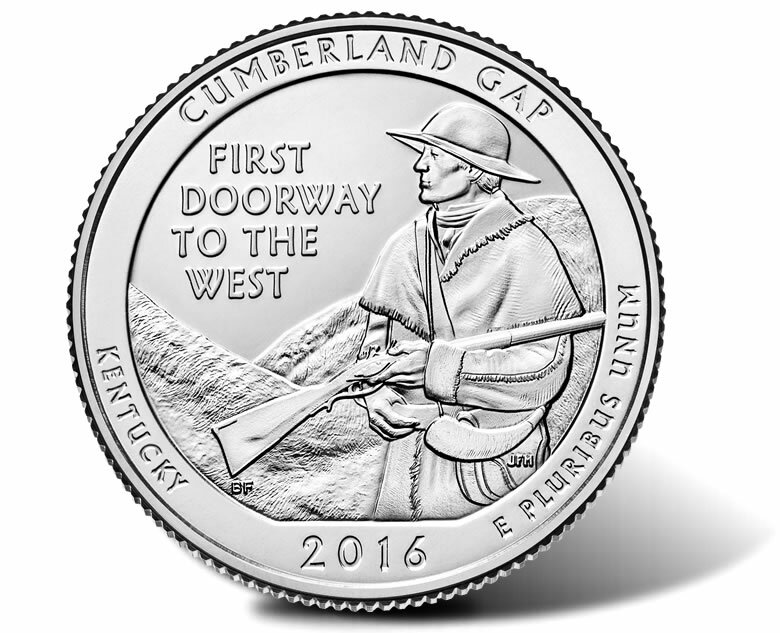 Designed by Barbara Fox and sculpted by Joseph Menna, the Cumberland Gap National Historical Park quarter depicts a frontiersman gazing across the mountains to the West. In the short U.S. Mint video below, Joseph Menna discusses his process of sculpting the quarter’s design. As designed by John Flanagan, America the Beautiful Quarters share an obverse portrait of George Washington. 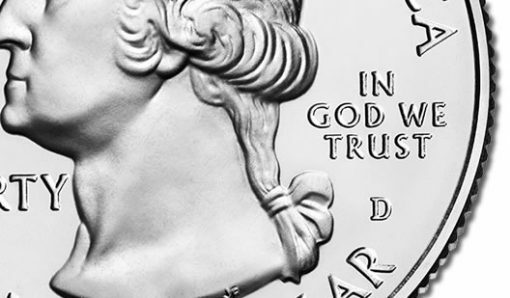 Surrounding inscriptions read, UNITED STATES OF AMERICA, LIBERTY, IN GOD WE TRUST and QUARTER DOLLAR. Obverses also have a mint mark of ‘P’, ‘D’ or ‘S’ to notate their production location in Philadelphia, Denver or San Francisco. 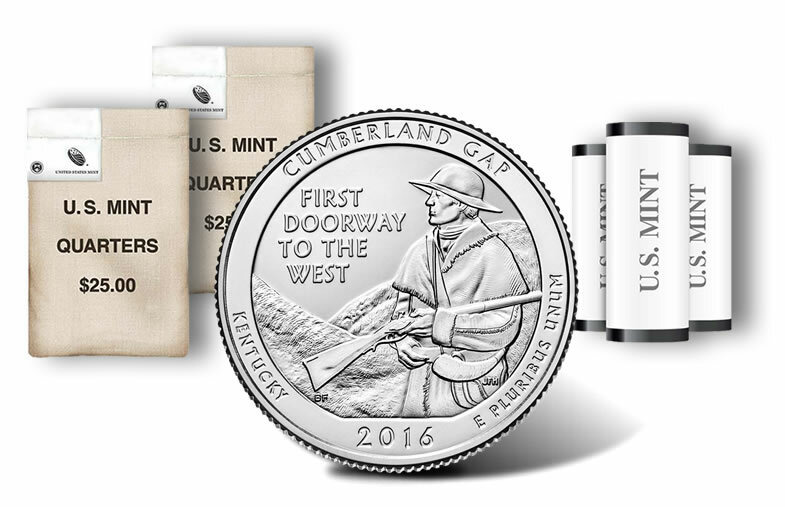 Quarters commemorating Kentucky’s Cumberland Gap National Historical Park are available in products that include 40-coin rolls and 100-coin bags with options of where they were made. Quarters struck in the Denver and Philadelphia Mints will eventually make their way into change. That’s not the case for those made in San Francisco. These are produced exclusively for coin collectors. Also, see photos of a proof Cumberland Gap quarter, another unique collector version that has frosted designs and mirror-like fields. Cumberland Gap quarters are available from the U.S. Mint’s online store at catalog.usmint.gov. Here’s a link to the Mint’s quarter products. Place orders by phone using 1-800-USA-MINT (872-6468). In 2010, the United States Mint introduced the first coin from its program of America the Beautiful Quarters, and the agency has released five every year since then. Some photos of the 2016 America the Beautiful Quarters taken at the San Francisco Mint. These are special collector proof versions that launch within annual sets. The first 2016 quarter, depicting Shawnee National Forest in Illinois, launched in early February. 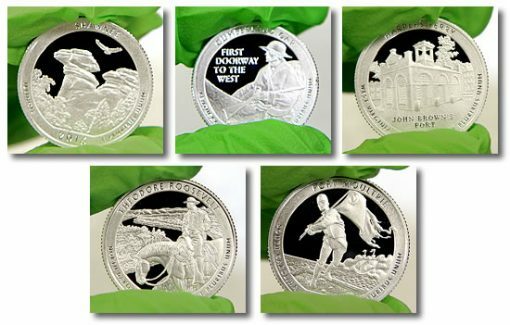 Upcoming 2016 quarters commemorate Harpers Ferry National Historical Park in West Virginia, Theodore Roosevelt National Park in North Dakota, and Fort Moultrie in South Carolina. The series is scheduled to end in 2021 after a quarter has been issued to commemorate a national site in all 50 states, D.C. and the five U.S. territories. Thanks for the updated information. You left out the U.S. Mint’s registered trademark on this coin program, which they are very protective of for sure! I totally agree with Mr. marcum. Cumberland Gap is in Tennessee. Even tho the park is in Kentucky, Virginia and Tennessee, rightly Tennessee should be on the quarter! I have one of these. But however on the reverse there is a line going through all the words likea perfect circle was made and not supposed to be there. D was the mint. Pictures dont show it. On November 5th I wrote that the Cumberland Gap quarter depicted the musket incorrectly. There were no left handed muskets. The lock is on the wrong side. I was a gun collector for over 45 years before I was attacked by the Baltimore Co. police and had my families 60 year 161 gun collection stolen. Private property stolen by corrupt police.